Similar to the related S. var. vitellina, but this cultivar has distinctive orange-red new stems. Matures to a large tree, but often grown as a large shrub by pruning hard back each spring. Fast growing, the new stems may reach 1.8M in one season. Long narrow leaves with a white downy undersides. Needs good moist to wet soil to grow well. 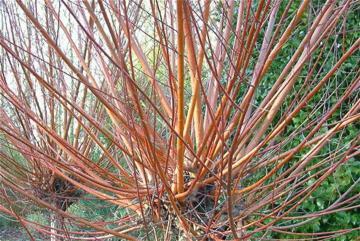 Prune hard back every year or two, to encourage new brightly coloured stems. May be cut low to the ground as a coppice or with a few feet of trunk as a pollard. May be kept by pruning to a rounded shrub of 1.8m x 1.8m. Originated at Britz near Berlin, Germany in the 1870’s.